This is the campaign log for the Sixteenth session of a google+run Wandering Heroes of Ogre Gate campaign. The previous session is described HERE. Last session the party had joined with Yang Tuo, the man who imprisoned them in the Jade Turtle to stop their schemes. They journeyed with him to the Kushen Basin, bringing the Face of Vaagu and restoring it. Once there Bone Breaker, San, Abbot Firebrand, Huo Ju, and Jade Priestess used the Talisman of Yao Feng to teleport into Iron Sky Realm (rather than take the gate and sky pole through the Face of Vaagu). They found themselves in a forest, and when they reached a village, San and Bonebreaker went on their own by ship to a neighboring mountain island (the whole place was a bunch of floating islands in the sky connected by waterways). They reached Superior Wisdom Sect, speaking with Sixth Brother of Iron Sky Maiden, an immortal and leader of the sect. He seemed uninterested in Bone Breaker or his troubles, simply telling him if he wished to see Iron Sky Maiden he should travel to Skylark Sect where Third Brother would be able to help. San and Bone Breaker asked directions and were told to follow the lake until they reached a river. That eventually they would see a mountain peak east of the river and that Skylark Sect was located there. It took several days. One evening they awoke to some movement in the forest. A group of dazed-looking people shambled from the trees and advanced toward them. San and Bone Breaker moved away, but the people pursued, breaking into a sprint when the twins moved into the lake. As the people closed in, a giant floating fish broke from the tree tops above the people. It was inflated like a puffer but had a mouth filled with long teeth. As it approached it sucked in the air and pulled the twins toward its jaws. They fled toward some trees, using them as a barrier. The people grasped at them. Trying to pull at their limbs. When the creature got close, it rammed at San and Bone Breaker, trying to impale them with its spiked body. The trees offered some protection and they used their Thunder Kick of the Zhang Twins technique to knock it back. This tactic eventually drove the creature, and its attending humans, off. A couple of the people, who Bone Breaker and San had killed in the melee, remained behind, so San searched their bodies (finding 100 taels and the Snake Lotus Manual). They resumed their trail along the lake. This brought them to a river, which they followed. However though the river continued to flow, the landscape came to an abrupt halt. Peering over the edge, they saw the river's waters course through empty space and fall several hundred yards to nearby floating mountain (where it continued to flow). San tried throwing stones into the water, only to watch them fall through the river. Bone Breaker placed a log and it seemed to float to the other side. Confident, Bone Breaker placed a larger log on the water. He attempted to ride across but slipped (failed Athletics roll) and sunk into the river. The moment he hit the water he took out the talisman and asked to be taken to Iron Sky Maiden. In that instant, he vanished. Back at the Kushen Basin, Chen was drinking fermented mare's milk with the Kailin Prince when a messenger from their information network arrived. He informed Chen that General Dee and Prince Yuan were planning to attack their holdings in the Ogre Gate Inn region. He estimated that they had 25,000 to 35,000 soldiers preparing to march. 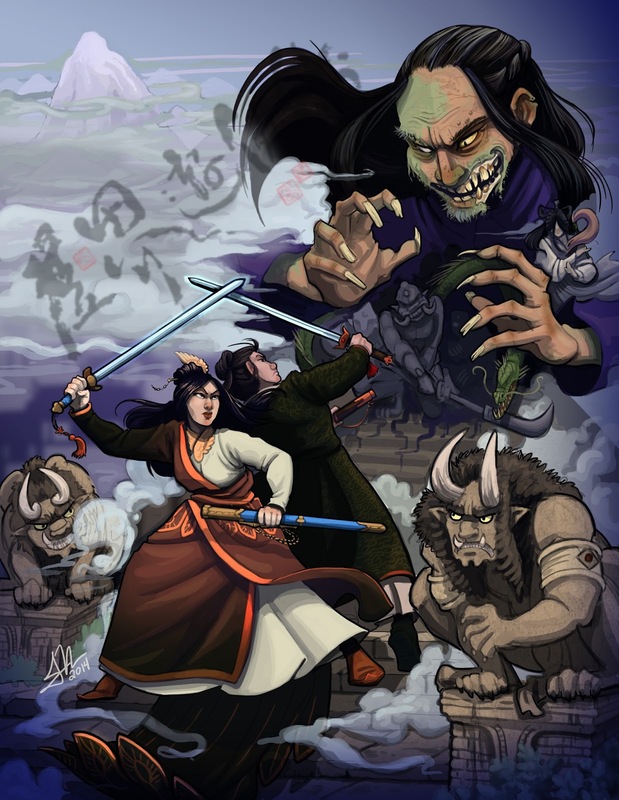 Chen convinced Prince Gol and Princess Samga to lead their 40,000 riders back to Ogre Gate with him. He also gave Prince Gol 50,000 spades if he could use it in the next three days to increase his forces. Chen also sent a letter to Bronze Master asking him to bring any martial heroes he could. The money had a modest but important impact, raising their numbers. When they reached Ogre Gate, they flooded a pass and laid traps. Bronze Master came with 100 heroes and offered to help assess the situation. They scattered their men in the hills and awaited the forces of General Dee and Prince Yuan. However once the army approached, things devolved to chaos pretty fast. Chen had superior numbers and they were able to ravage the invading army. However they lost 15,000 men in the process. They surrounded General Dee's army and slaughtered most of them; taking only 100 prisoners (including Prince Yuan and General Dee). Chen took the general for questioning, using their House of Paper Shadow musicians to summon shadow puppets to paralyze him. He laughed at Chen and asked how long he thought the House of Paper Shadows would remain loyal after they'd betrayed the Demon Emperor. Bronze Master and the Kailin expressed concern about the King of Li Fan, saying they had at least 100,000 soldiers and would be sure to use them when news reached the capital (to say nothing of the Empire itself). Chen persuaded Bronze Master to use his Shift of the Chameleon Technique to impersonate the general and return to Hu Qin with some men dressed as soldiers (to buy them time). In Iron Sky Realm, San cobbled together a raft from some local bamboo trees and set it afloat in the river, then floated over to the other side. She followed the river's course and found Bone Breaker passed out on the shore. He clutched the Talisman and it was glowing red. "Bone Breaker has committed many sins, has been corrupted by demon magic and has entered into illegal agreements with the Demon Emperor; how does he plead?" In the course of the trial, Bone Breaker admitted his faults and gave back the talisman to Supreme Judge Yu. He then asked for Iron Sky Maiden's help protecting his family and himself. She promised to help him if he pledged himself to her and to Hen-Shi, relinquished his demon magic and if he agreed to wear the Belt of Mercy. Placing the belt of mercy on him, she instructed that any act of cruelty he committed would inflict harm on him as well as the belt tightened. Bone Breaker then asked for compensation for losing his demon magic, as he could not serve her as well so hindered (he had lost his arm and his endurance in exchange for the powers). She agreed but on the condition that he unite the martial sects under a just and competent leader and promised to cultivate. When he agreed, she touched his temple and transmitted the Profound Technique: Dreams of Infinite Sky realm to him. She also instructed him in Adaptation of the Maimed (a technique for overcoming his physical limitations). She then instructed them to return with Supreme Judge Yu, who transported them back to the Human Realm. When they returned, they were joined by Jade Priestess, Sand Demon, Yang Tuo, Abbot Firebrand, Huo Ju and Abbot Ping. Bone Breaker headed south with Yang Tuo, Jade Priestess and Huo Ju to unite the sects, and San took the rest of the group to the Ogre Gate Inn to learn more about the situation there (they had received a message informing them of the invasion). Bone Breaker and his group went to the Nature Loving Monk sect, finding them in a grove deep in the south. They spoke with Green Beggar explaining they wanted to unite the sects. Green Beggar was open to the possibility but said the martial world would only follow someone who possessed the Phoenix Crown of Bao and the Wind Saber of Sunan. After a night of drinking with the beggars of Nature Loving Monk Sect, Bone Breaker and his group left for the mountains to cross into Hai'an. San reached the inn and discussed possible strategies with Chen. They hired a Zun Demon Master to secure the Ritual Vessel in Zhang Kang's lair, then shipped it as a gift to Fan.